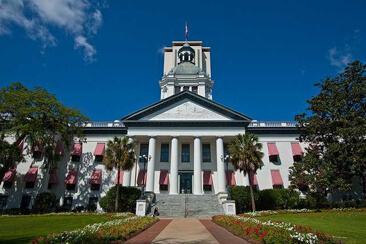 Florida Farm Bureau’s State Board of Directors has voted to recognize legislative leaders for their outstanding work and contributions during the 2017 legislative session for Florida’s agricultural producers. Farm Bureau’s Legislators of the Year and Champions for Agriculture provided leadership on key bills and issues that will significantly improve and strengthen our agricultural community in Florida, including a reduction in taxes and regulations. This year, Florida Farm Bureau will recognize Sen. Denise Grimsley and Rep. Jim Boyd as Legislators of the Year and 20 Champions for Agriculture. During the 2017 legislative session, Sen. Denise Grimsley championed issues important to agricultural producers in many different ways, helping to pass important policy items and helping to secure funding for the University of Florida’s Institute for Food and Agricultural Sciences (UF/IFAS). Sen. Grimsley allowed a Farm Bureau-backed bill dealing with pollution notification requirements to be amended onto SB 1018, her bill relating to contaminated sites cleanup, which ultimately led to it passing the Legislature. Sen. Grimsley also sponsored SB 600, a priority of Agriculture Commissioner Adam Putnam aimed at strengthening economic development opportunities in rural Florida. Additionally, Sen. Grimsley sponsored several key UF/IFAS funding priorities and was able to add $1 million in workload funds, increasing the base budget for UF/IFAS. Sen. Grimsley also worked to overturn several of Gov. Rick Scott’s vetoes within the UF/IFAS budget, including funds for 4-H.
Rep. Jim Boyd has been a leader on many issues during his time in the Florida House of Representatives. He has been a friend to agriculture, Florida Farm Bureau and the Manatee County Farm Bureau over the years, winning the Champion for Agriculture award every year since it was created in 2013. In 2017, Rep. Boyd helped secure $2.3 million in sales tax exemptions on prescription and non-prescription animal health products used for poultry and livestock. As chair of the House Ways and Means Committee, Rep. Boyd was tasked with creating the House’s proposal to cut taxes for Floridians. In his original $297 million tax cut package, Rep. Boyd included more than $13 million in sales tax exemptions for agriculture, including animal health products, farm fencing materials, compressed and liquefied oxygen used for aquaculture and an expansion of the exemption on farm trailers from $20,000 to $25,000. In addition to securing $2.3 million in sales tax exemptions, Rep. Boyd also co-sponsored two bills on Florida Farm Bureau’s legislative agenda: HB 545 which included language to expand the agriculture truck tag exemption to statewide and HB 7085, a common-sense and pro-business solution to reduce rapidly increasing workers’ compensation costs on employers. Florida Farm Bureau also honors 21 Champions for Agriculture – lawmakers who go above and beyond to support and promote legislation that positively impacts agriculture. Farm Bureau named six Senators and 15 Representatives as Champions for Agriculture in 2016. “Florida Farm Bureau appreciates the commitment of our state lawmakers to Florida’s agricultural producers and we sincerely thank them for their role in supporting Florida Farm Bureau and our state’s farmers and ranchers during the 2017 legislative session,” said John Hoblick, President of Florida Farm Bureau.